Dublin schoolteacher Christopher Fettes fouded the Ecology Party of Ireland in 1981 in order to promote environmental concerns. After a year of building up, the party contested the November 1982 election with just two candidates in Dublin - Roger Garland in Dublin South and Máire Mullarney in Dublin South East. The two candidates did poorly, each securing around 1% of the vote. Over the next five years the party continued to develop and run in elections. In 1983 it renamed itself the Green Alliance. Its performance in the 1984 European Parliament election was a slight improvement on 1982, with 1.9% of the vote going to the party's candidate. Their first success came in the 1985 local elections when Marcus Counihan was elected to Killarney Urban District Council. Despite this small success, the party still did not run any general election candidates outside of Dublin in 1987. The previous two candidates ran again, with the addition of Trevor Sargent in Dublin North. The party's gradual improvement in performance continued with this election - each candidate won between 2-3% of the vote, though none of the three would win a seat. Later in the year the party renamed itself once more - this time to the Green Party. 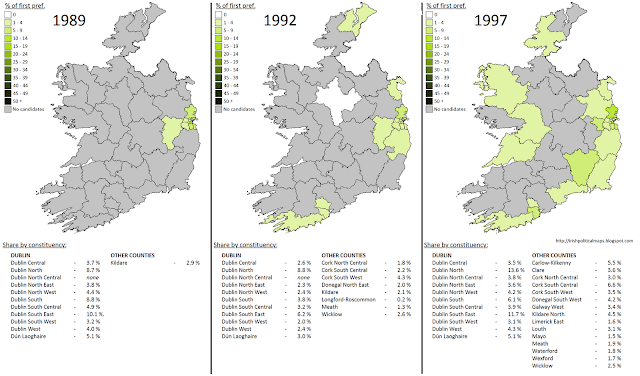 The 1989 election had the party venture outside of Dublin for the first time, with Seán England running for a seat in Kildare. The Greens' activities in Dublin were substantially increased, with candidates in all constituencies but Dublin North Central. Their success was varied - the lowest polling candidates each received around 3% of the vote, while some polled much higher. John Gormley of Dublin South East received 10.1% of the vote, narrowly missing out on the last seat. Success came to one candidate: Roger Garland took the Green Party's first ever seat in Dublin South, which he held until 1992. The party expanded its operations for that election, running candidates in Cork for the first time, as well as Donegal, Louth and Wicklow. An attempt to win a seat in the rural constituency of Longford-Roscommon yielded the party's worst result to date: only 0.4% of the vote was won. As with the Labour Party, it appeared the Greens' best support was from urban constituencies - particularly, of course, in Dublin. Trevor Sargent won a seat in Dublin North, balancing Garland's loss. Sargent's share of the vote would rise higher than any other candidate in the following general election, which saw John Gormley join Sargent in the Dáil, doubling the party's representation. 1997 also saw more Green candidates than ever before, and compared to the previous two elections a slow increase in the Green vote, not only in Dublin but in Cork South Central and Kildare as well. The party's future looked bright, and it even entered presidential politics that year (on a marginal level) by supporting the Labour/Democratic Left candidate Adi Roche. During this time there was also a Green presence in Northern Ireland, albeit not to the extent seen in the Republic. In the same year that the Irish Ecology Party first ran for the Dáil, the UK Ecology Party fielded two candidates in Northern Ireland Assembly constituencies. As was the case in the Republic, the party yielded negligable results. Due to the tumultuous political events of the time, there were no further Assembly elections in Northern Ireland for another 14 years. In this time, the UK Ecology Party also changed its name to the Green Party (UK). In 1990 the Northern Ireland branch of the party seperated from the UK party, and upon doing so became the Green Party of Northern Ireland. The party operated alongside the Irish party for 15 years before voting to merge in 2005. The party's performances in the general elections of 1996 and 1998 were extremely poor compared to the performance of the party in the Republic. The NI Green Party ran candidates in every constituency in 1996 but few received more than 0.5% of the vote. The party scaled down significantly in 1998, running just three candidates with similar results. Success for the Green Party in Northern Ireland was not to come so soon.